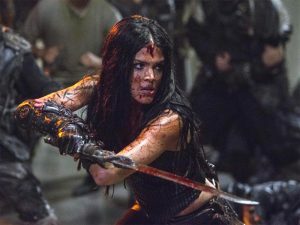 After the destruction of the surface world Octavia and the survivors inside the bunker face ongoing tensions in the face of overpopulation -- made worse when a group of Skaikru commandeer the underground farm level and barricade themselves inside. Last edited by GateWorld; September 9th, 2018 at 09:03 PM. Well that's one way to control the population. I wonder how Octavia feels about what she's had to become, I'm looking forward to finding out. I'm going to miss Jaha, but I thought he had a good death and his story did feel complete. I'm looking forward to the next episode. I haven't seen this ep. yet, but I will say that any death for Jaha is a good death, as long as they don't find a way to bring him back. As far as I'm concerned, he lost the right to consume oxygen a few years back when he threw those kids into the monster's mouth to save his own sorry hide. You can't seem to let that one go. Not as long as they let him live I couldn't. Why does this episode look like I've seen it before? Oh, yeah, that's right, I have. There is a peace treaty/agreement in place. One group or another decides to break it and a bloodbath starts. Not so sure I like Octavia's culling plan, even though I understand the reasons for it, and in some ways it makes sense. Oh, well, at least Jaha is dead.